You begin play with the second highest victory point (VP) count, 16 to the Hapsburgs’ 18. As the game opens, your land forces are clustered around Istanbul and Buda. However, you are also in control of a powerful but scattered navy. Your time will be split between engaging in piracy, fleet actions, and taking keys. Another choice is the “Tunis option.” Spring deploying a token force to Buda will most likely scare off the Hapsburgs. Consider burning a 5 CP card to put fleets into the Aegean Sea and North African Coast on the first impulse (2 CP). Then naval transport a decent-sized army to Tunis, an independent key (3 CP). Taking this key will net you a nice 2 VP without ticking off the Hapsburgs directly. Then you can build up a fleet of pirates and raid the Hapsburgs, French, or Papacy. 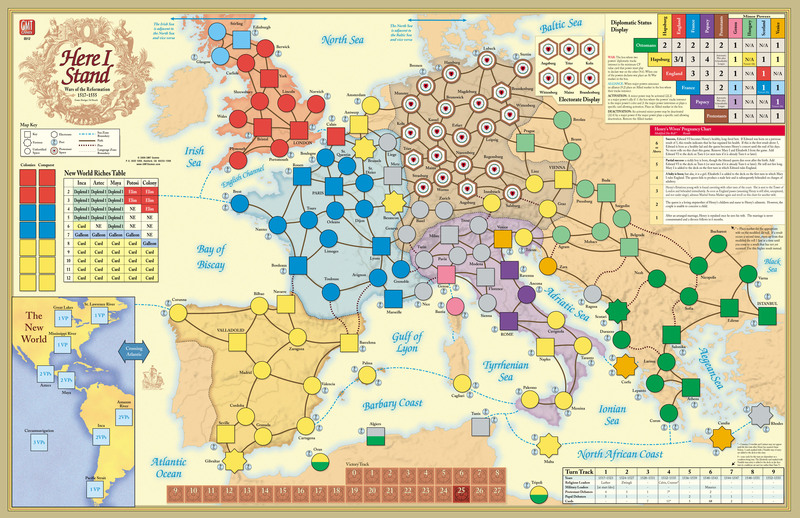 A third choice is the “Venice option.” Through careful wheeling and dealing, go to peace with the Hapsburgs and declare war on Venice (a minor power). You’ll need a powerful navy to blockade Venice, but snatching up that key and threatening Italy might be worth it! Keep in mind that declaring war on Venice will allow the Papacy to intervene (2 CP), thus putting you in the Pope’s bad graces (but who cares, right?). Never hesitate to speak with the Protestants and English. They don’t directly threaten you in any way, so you can usually work out some deals. The Protestants are “card hunting” for key Reformation events; if you have these, you may be able to get a random card draw from them or a promise to play “Foul Weather” or “Gout” on your behalf. It’s usually good to talk to the French too; if both of you decide to go after the Hapsburgs at the same time, you can make great gains and keep the Holy Roman juggernaut off balance. I would also argue that there is a time when making peace with the Hapsburgs is a good idea! This agreement will allow both of you some breathing room to pursue other interests elsewhere (for you, Tunis or Venice…for him, electorates, Calais, Metz, etc.). Because Here I Stand is a card-driven wargame, you obviously can’t prepare for most situations that will come up. However, you can stay on the lookout for opportunities. Tunis, Venice, Vienna are your three key considerations. If you ever see that you’ve got a good shot at taking one, go for it! Later in the scenario, the Hapsburgs may need to draw forces out of Italy to deal with threats elsewhere. If this is the case, feel free to nab Naples. If you can build up a strong pirate fleet, go a’raiding and just pick at whomever you feel needs to be brought down a notch or two. You may even be able to get something in exchange for going after a particular power (“Hey Martin Luther…what would you offer me if I agreed to raiding the Papacy?”). Through careful use of pirates you can leech resources from your enemies. You will be tempted to use your home card in all sorts of situations; gauge carefully where it will do the most damage and let your janissaries do their worst. In short, playing the Ottomans gives you the perfect opportunity to play the “Boogeyman” of Europe during this period; enjoy it!